The old well-house is accessed easily. From the main road of Henderson Street (or A9), that runs through the town, as you approach the main shopping area, go up Alexander Drive, then immediately turn right up Well Road. 100 yards up, take your first right again along Kenilworth Road and then first right up Mine Road. 100 yards or so along here, as you reach the tennis courts on your right, a small crumbly-tumbly building is to your left, just by the car-park to the hotel, with some old trees hiding its presence. You can’t get into it and the waters therein sound to have fallen silent. 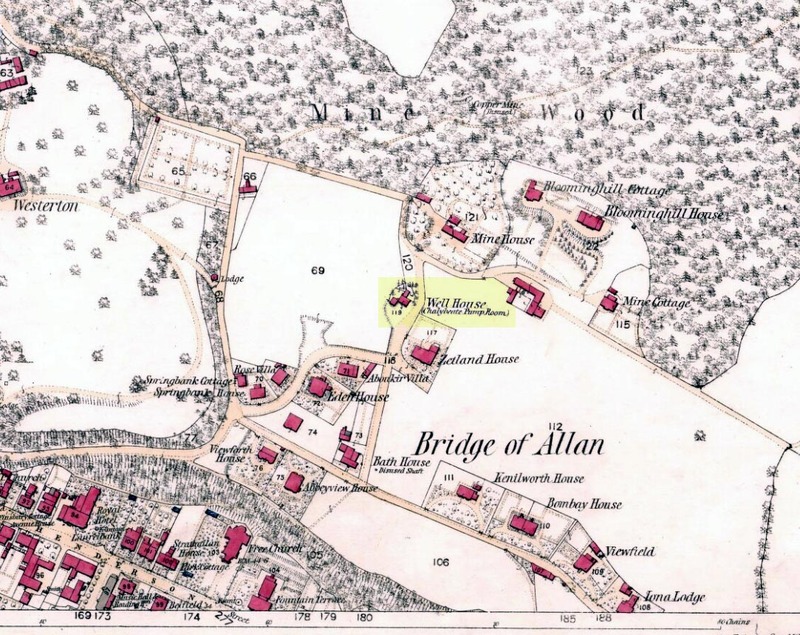 Perhaps the earliest literary description of this site, the Bridge of Allan that we see today was little more than a stretch of old abodes, reaching into woodland above the crystal clear river and burns, chiming with countless fauna and that rich chorus of colours that pre-date the Industrialist’s ‘progress’. 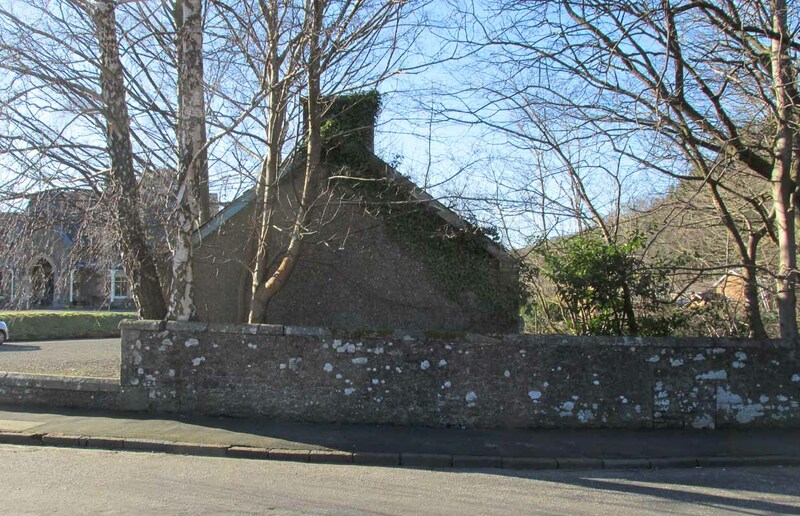 The old hamlet was said by Robert Chambers (1827) to be “a confusion of straw-roofed cottages and rich massy trees; possessed of a bridge and a mill, together with kail-yards, bee-skeps, colleys, callants, and old inns.” But all of this was about to change. This comment was echoed a few years later when Charles Roger (1853) wrote his extensive book on the village. The fact that Sunday mornings was when people came here tell us that the Church had something to do with the timing; strongly implying that the wells possessed earlier indigenous traditions—probably similar to those practiced at the Christ’s Well, the Chapel Well and countless others across the country. But written records on this are silent. 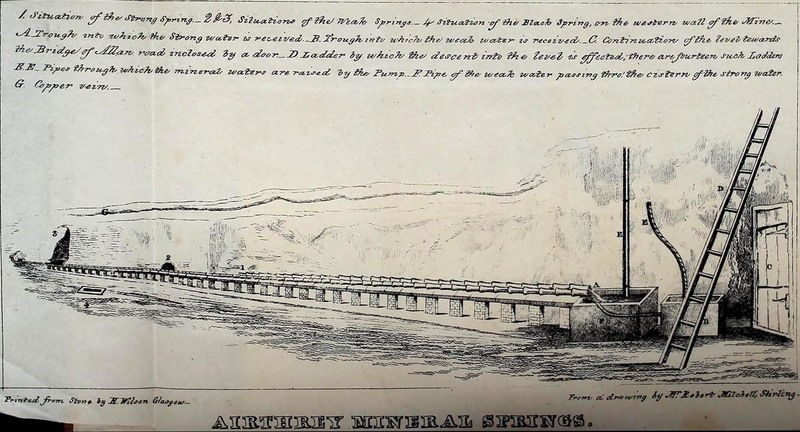 The main history of the Airthrey Springs is of them becoming famous Spa Wells and, much like Harrogate in Yorkshire, were responsible for the very growth of Bridge of Allan itself. Oddly enough, this came about a few years after the copper mines were closed in 1807. This wouldn’t have stopped some of the local people still getting into them and drinking the waters when needed—but the written records simply tell that, for a few years at least, their reputation faded. Around the same time in the village of Dunblane, just a few miles to the north, another Spa Well had been discovered and it was attracting quite a lot of those rich wealthy types—bringing fame and money to the area. As a result of this, the medicinal virtues of the Airthrey Springs were revived thanks to the attention of the local lord, a Mr Robert Abercromby, who thought that Bridge of Allan could gain a reputation of his own. And so in the winter of 1821-22, Abercromby procured the research chemist Thomas Thompson to analyse the medicinal waters at Airthrey and have them compared with the ones at Dunblane. He was in luck! Not only were they medicinal, they were incredibly medicinal! “caused the water of the two Springs analysed by Dr. Thomson, one of which was characterised by its strength, the other by its comparative weakness, to be carefully collected and conveyed apart in earthen pipes, to two stone troughs placed in a convenient situation, from which it was raised by two well-constructed forcing pumps. Over these pumps a commodious house was erected. 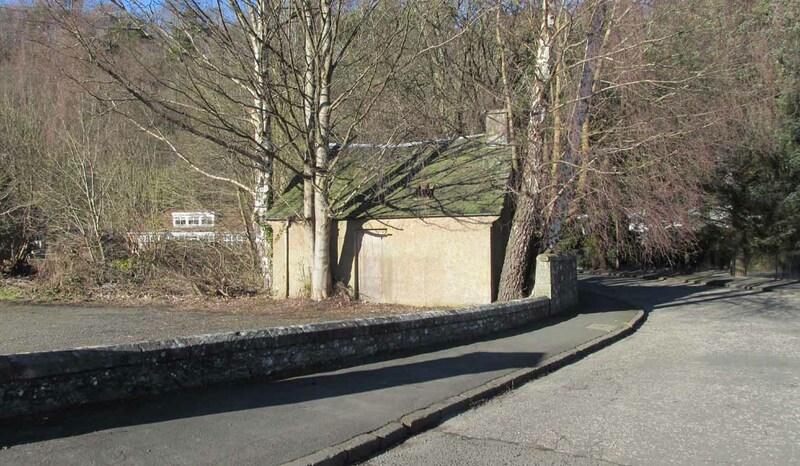 The success of these medicinal waters created the town itself and, unlike many other spa wells, this one continued to be used until the end of the 1950s. Its demise came when, in one financial year, only two people came to “take the cure,” as it was called. Durie, Alastair J., “Bridge of Allan: Queen of the Scottish Spas,” in Forth Naturalist & Historian, volume 16, 1993. Erskine, John, Guide to Bridge of Allan, Observer Press: Stirling: 1901. Fergusson, R. Menzies, Logie: A Parish History – 2 volumes, Alexander Gardner: Paisley 1905. Forrest, W.H., Report, Chemical and Medical, of the Airthrey Mineral Springs, John Hewit: Stirling 1831. Roger, Charles, A Week at Bridge of Allan, Adam & Charles Black: Edinburgh 1853. Stewart, Peter G., Essay on the Dunblane Mineral Springs, Hewit: Dunblane 1839. Thomson, Thomas, “On the Mineral Waters of Scotland,” in Glasgow Medical Journal, volume 1, 1827. Turner, E.S., Taking the Cure, Michael Joseph: London 1967. This entry was posted in Holy Wells, Scotland, Stirlingshire and tagged antiquarian, antiquities, Archaeology, Bridge of Allan, copper, Dunblane, earth mysteries, healing springs, heritage, historic Scotland, Holy Wells, hydropathic, hydropathy, mineral wells, Ochils, spa wells, spas, Stirling, Stirlingshire, water. Bookmark the permalink.